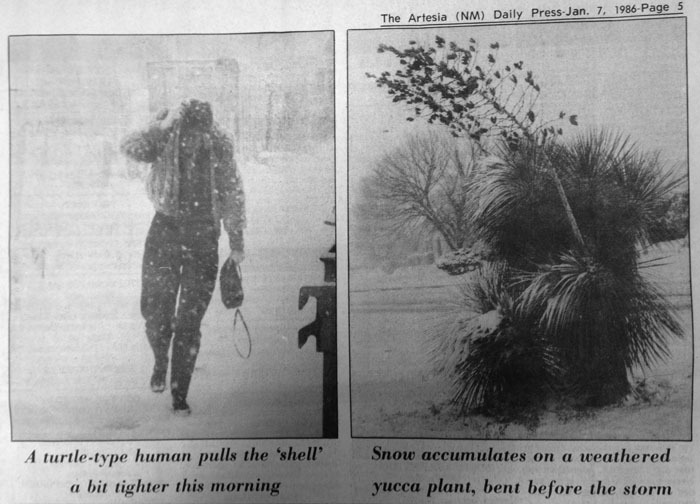 Looking back 40, 30 and 20 years ago, the following are excerpts from the Artesia Daily Press from Jan. 3-9. Mrs. Guadalupe Rodriguez gave birth to Artesia General Hospital’s first baby of 1976 and her own fifth child at 6:05 a.m. Jan. 2. The six-pound boy has been named Dennis Johnathan. Maternal grandparents are Mr. and Mrs. Federico Coda of Artesia. As reported in the Pinon News: About six inches of snow fell in the Avis and Pinon areas Tuesday of last week. The weather has been warm and the moisture was needed. Mrs. Ethel Smith reported there had been rain and snowy weather at her ranch south of Pinon, and Mrs. Irving Porter reported six-tenths of an inch of rain at their ranch Sunday before it snowed on Tuesday. The snow was falling heavily and the roads were dangerous Tuesday evening, so Bible study was dismissed at the Church of Christ. The State of New Mexico had occasion to wish itself a hearty Happy Birthday today as it marked its 64th anniversary of becoming one of the United States. Peggy Springer, an employee of the New Mexico Employment Office in Artesia, displayed the golden Zia symbol which adorns the state’s flag and symbolizes New Mexico’s entry into the union on Jan. 6, 1912. Artesia High School sophomore Steve Messmer has been named “Teenager of the Year” by the Soil Conservation Society of America. Donald Alam, district conservationist with the U.S. Soil Conservation Service, presented Messmer with the award this morning in recognition of Messmer’s efforts last March in organizing a group of Park Junior High School students who spent two days reseeding a fire area in the Sacramento Mountains. Artesia Public Library Board President Ted Pearson showed board members the 1906 certificate signed by territorial secretary J.W. Raynolds, which officially incorporated the Artesia Library Association. The library, which later reverted to city operation, has been in continuous operation since Jan. 5, 1906, and will this month host a birthday party in recognition of its 70th anniversary. Board members inspecting the incorporation certificate were Pat Myers, Jody Vanderver, Harriet Cockran, Judy Yates and Margaret Worthington. Amastacia Moreno of Dexter cradled her newborn baby boy, the first baby born in Artesia General Hospital in 1986. Efrin Moreno weighed seven pounds, 10 ounces at birth at 4:30 a.m. Jan. 2. Mrs. Moreno and her husband, Salmon, will be offered a steak dinner compliments of the hospital auxiliary, a practice the group is beginning with the New Year baby. Mike Casabonne of Hope has been named an outstanding supervisor by the board of supervisors for the Penasco Soil and Water Conservation District for his past and present conservation achievements in leadership. Casabonne has served on the Penasco Soil and Water Conservation District board for eight years as chairman, vice chairman and secretary-treasurer. He has taken the role of leader for numerous tasks for the district while serving on many committees as chairman. Artesians awakened to accumulations of up to six inches of snow after a cold front carrying moisture moved into the area Monday night. Whipped by winds, a slow, freezing drizzle spattered down throughout the night until early morning hours, when the snow began. At 7 a.m., the Agriculture Science Center south of Artesia reported an inch-and-a-half of snow had fallen. Snow continued to fall throughout the morning and was falling at press time Tuesday. Road conditions throughout southeastern New Mexico were snow packed and slick except in the Hobbs area, which remained dry. As reported in the Pinon News: Dave Rogers with the Alamogordo Daily News called Mrs. Oza Holcomb Wednesday of the past week wanting to know if she could help him with a news item. It is hoped she helped him some, but she did not know too much. He reported his wife is in the armed forces, and the plans are she will be shipped to Portugal in the near future. Curtis Teel was presented with a watch from the United States Postal Service after almost 42 years of service. Teel was honored at a ceremony at the post office Friday. His wife, Kaye, was present. He had worked at the post officer longer than anyone. A 52-inch RCA home theatre projection stereo monitor-receiver was $1,999 at Terry’s Electronics. A transmission service was $64.95 at Gateway Motors Service Center. Allsup’s milk was $1.99 per gallon, and Shurfine eggs were 89 cents per dozen.